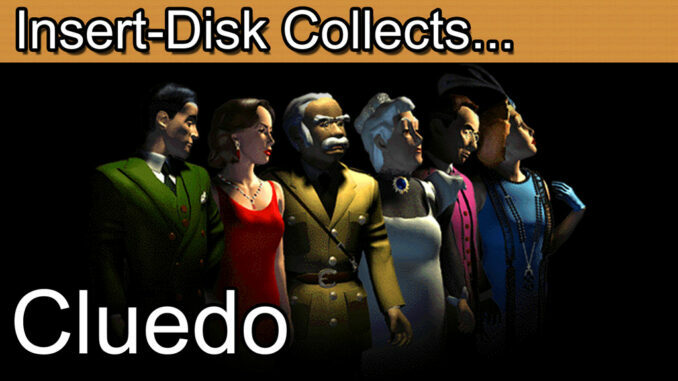 Insert Disk collects Cluedo for the PC. Today’s retro game review is Cluedo: Murder at Blackwell Grange for the PC. This retro gaming classic is an interpretation of the classic board game Cluedo or Clue in the USA. Use your wits in a game of murder mystery to find out who murdered Dr Black, in which room and witch which murder weapon. This game is sometimes known as Murder at Boddy Mansion but Murder at Blackwell Grange in for its international release. Greetings collectors and welcome to today’s retro game review. There’s been a murder at Blackwell Grange and you’re all invited to join me to find out who did it, in which room and with which weapon. Yes, of course it’s Cluedo or Clue as our friends in the US call it for the PC. Now, before I continue I’ll just clear up a few the naming convention of this one. This episode is going to focus primerally on the 2001 PC edition of the game rather than the long history of the board game itself. I think that it important that I set the scene though. If nothing else to stop the 100’s of comments of why I’m pronouncing certain weapons or suspects names in a way you might not be used to. As a brief history, the game was devised by Anthony E. Pratt during WWII under a draft version initially named “Murder!”. Which actually has a good ring to it if you ask me. After the war Waddington’s picked up the publishing rights and renamed the game “Cluedo”. A combination of the words “Clue” and “Ludo”. “Ludo”, being the Latin for “I play”. Here in the UK it was common to use the word “Ludo” for a dice rolling game. Typically this is the version of Ludo I think of as it’s the variant I used to play as a child. See, we are still cultured enough to use Latin over here. So, Clue plus Ludo and you get Cluedo. A game with clues and dice rolls. Cluedo was later licensed to Parker Brothers for publication in USA. Parker Brothers felt that simplifying the name to “Clue” and making other small tweaks was in the best interests for the US market. By the 1950’s the Clue that most American’s recognise today had emerged. Along with the name change of the game expect to see a few other minor differences. Here in the UK the murder victim is called Dr. Black but Mr Boddy in the US edition. Miss Scarlet is spelt with a single “t” in Clue is called “Miss Scarlett” with a double “t” in Cluedo. There is still some debate over this but if you as most British people. Scarlett with the double “T” is mainly used for people’s names. For example Scarlett Johansson. Scarlet with one “T” refers to the colour of deep red called scarlet. As in The Scarlet Witch. In this sense it actually makes the international version of Cluedo a little out of step. Whilst all characters are names after colours you will find certain prints of the British edition with “Scarlett” with a double “T” which technically is not the preferred spelling if you are referring to the colour. Either way, just an interesting quirk of design I guess. Finally in the US this weapon is called a “Wrench”, in Cluedo you will hear this referred to as a “Spanner”. This is just good old fashioned UK vs. US English terminology. Perhaps the most notable difference in naming convention is with Mr Green. In the international version of Cluedo Mr Green’s original name of the Reverend Green is still retained. You can even still see the collar on his profile card. It’s worth noting that whilst the board has largely been left unchanged over the years the weapons themselves have had several iterations. By mother’s 1950’s set has a really good sharp knife and real rope. Whilst mine. Well, it’s a plastic rope and the dullest knife you’ve ever seen. I preferred the world before health and safety was a thing. With all that said, the games actually play the same in all territories. Although most families will create their own house rules for some aspects of the game. Anyway, on with the game. This is the 2001 PC edition of Cluedo, Murder at Blackwell Grange. I picked this one up for the princely sum of 75p. That’s about a dollar for the US audience. An altogether excellent price for what you get here. The packaging is very much a no frills DVD case but Infogrammes did a really nice job here. The design is nicely executed and the back of the box tells you everything you’d want to know about the game. This includes the PC specs. Hold on to your hat because you’ll need Windows 95/98. I’m actually running this on Windows 7 without issue. A Pentium 133Mhz, 16mb of RAM. You may also want to really go all out with a 1MB Ram graphics card, a sound card and 40MB of hard disk space. If you have a 28,800 band modem why not hit the information super highway and sleuth your way to victory with other detectives around the world. Just for fun I thought I’d show you the install process on this one. First up, select either the US or UK version of English that best suits you. This will put all the standard localised naming conventions in place which is a nice touch because language and terminology is one of those things that can really break an experience. I’m sure that whether you speak UK / US / Australian /Canadian or any another variant of English some words can be really jarring to the ear. Things like the word faucet in US English rather than tap get me every time. Similarly us Brits say all kinds of weird and wonderful things that we don’t understand even between our counties. Anyway, pick your favourite and on to step two. The install option. A, B or C. So do you want to eat up 15, 25 or a whopping 91MB of your hard drive? In this day and age it really doesn’t matter too much. 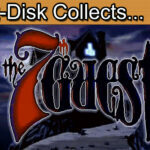 This will simply determine how many file the game disc will copy over to your hard drive. Back in the day this might have had a benefit of increased loading speeds but now just a nice relic of install history to reminisce over. Choose an appropriate folder and then… 3, 2, 1… Cool were done. A bit different to that monster Phantasmagoria experience I had to get through some time ago. From here on in it gets very murderous indeed. The intro video is 320 x 240 pixels so expect a whole tonne of pixilation. I’m really fond of this introduction though, it just brings back so many memories of when having a CD ROM drive was the must have accessory for your PC. It’s a competently rendered beginning to our evening and really sets the tone if you’re having a murder themed night of fun with friends. Also, that selection we made in the install. You will either get the Clue or Cluedo introduction which shows a nice level of attention to detail from the developer. Now, before you begin I would suggest having a quick breeze through the preferences. In particular I would turn on the auto notes option. It will just save you a bit of clicking later on during the game. You may also want to turn the music levels down just a bit but be sure to keep the butlers narration on because his voice over really makes this game what it is in my opinion. 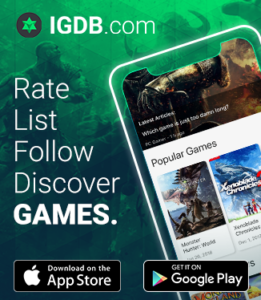 From here select either a local game or you can choose to network. Not surprisingly I couldn’t find another player out there so locally it is. Now it’s a case of setting up your game. You must have a minimum of 3 players in total and these can be allocated as human player or the computer. The options allow you to set up the computer players as novice, normal or expert. This will adjust the difficulty as the players will make better notes to enable them to deduce the solution faster on the expert setting. Now, here’s where the game lets you customise the experience further with a classic mode or a no die roll option. In the classic edition you will roll a single die and be able to move the corresponding 1 to 6 squares. However, the no die roll option allows every player to move 9 squares on each turn. This breaks with the classic formula but I actually preferred this option because let’s face it, rolling virtual dice is never going to be a highlight of the experience. Queue the next nifty animation and the ghostly hands of fate deal out you weapon, room and suspect cards. Again, this didn’t have to be in there but it really helps set the tone of the experience. It’s first best to check the cards you were dealt at the beginning of the game. Here I have a couple of rooms, the spanner, lead pipe, revolver and Mrs White. I therefore know that these can be eliminated from my enquiries. Over to my detectives card and I can see that these have already been highlighted and colour coded. However, I can add extra circles, ticks or crosses in by each element as I investigate and ultimately make an accusation. Now, the isometric view can be a little jarring at first even if you know the layout of the mansion so you may want to clock to the overhead view to get your baring’s. To move you can then click the die and indicate where you would like to move. Each player takes their turn. So here, Miss Scarlett suggests Mrs White with the spanner in the lounge. The Reverend Green has at least one of these cards. I happen to know that it must be the lounge as I have Mrs White and the spanner in my collection so this was actually a very good opening round for me to observe. Notice how it wasn’t myself that made the suggestion yet I can still learn from the other players. Since Reverend Green then accuses Mrs White I must show what I know about the accusation. Now, I’m going to head over to the hall and make some suggestions of my own via the light bulb icon. I’m holding Mrs White and the revolver so this is a clear-cut chance to find out if anyone is holding the hall card. As a result the Reverend Green can show me that he holds the hall card so I can now happily illuminate it from the investigation. By the same token, Miss Scarlett if she was watching knows that the Reverend Green must hold Mrs White, The hall or the revolver. So, fast forward a bit and Miss Scarlett suggests herself with the spanner in the dining room. From this I know that the Reverend Green must hold either the Miss Scarlett card or the Dining room since I know I have the spanner. I’ll mark this one up with a circle which I’m using as a code for “may have” this card. If I can make a tactical suggestion later I may be able to deduce which one it was if Miss Scarlett shows me one of the two cards. Or it may be that Reverend Green has both himself. As long as you have a system though you will get to an answer. As you might expect the game continues and gets even more intriguing. Make notes, deduce the possible outcomes, tactically move player to a room by accusing them and use the secret passages. In essence it’s classic Cluedo. You get to a state where you can deduce that certain characters don’t hold certain cards and therefore can adapt your questioning towards them strategically. I’d need a whole other episode on Cluedo strategy to explain this all fully. Be rest assured though that what works on paper works well here. What works well is the background music. The old timey jazz trumpet keeps the game on theme and just really sets the tone as the suspects pace around the mansion. Each room also has its own detailed sound effects which again isn’t overstated but subtle enough to make the house feel like a real setting. Add in to this the creepy butler narrating the events and you have yourself a very pleasing experience. Is it perfect, no but it’s definitely true to the Cluedo experience in most respects. I do have to say that when playing the physical game I record my deductions a little differently to that of the PC edition. I tend to divide up the pad for how many players there are, this then lets me either fill in with a yes, no or maybe and is by far the clearer recording method in my mind. Say for example I suspect that both opponents have the candle stick. In the PC game I can only mark 1 specific colour. On a physical pad I can put a question mark against each player individually which is clearer at a glance. It’s not a deal breaker but I happen to know that this is quite a well-known methodology for Cluedo players so was surprised not to see an option for it in here. It’s a small gripe but won’t ruin the fun of the game play. Inevitably one of the players will make an accusation, the murder solution is revealed and someone goes away for a long time in a grey prison cell. Overall I’d definitely recommend this version of Cluedo to gamers that enjoy the board game. It’s close enough to the physical experience to slot straight in and start having fun. It certainly doesn’t replace it as an experience but it does offer a few decent hours of fun. There have been any number of physical game variants, video game editions, TV adaptations and of course one of the best movies of all time based on this classic board game. It may only be 640 x 480 resolution and some rather dated CGI interludes but the format of the game and execution really sees this one through to being an enjoyable experience. For the bargain bin price that you can pick this one up for there really are no excuses for not giving this one a go. Until next time good luck with the detective work and happy gaming.